19 Weeks Pregnant WITH BOYS! Today I am 19 weeks pregnant! I know this is my second post this week but this one is to just give a general weekly update. If you missed my last post about the big MFM/ultrasound appointment, you can read that one here. I want sincerely thank everyone for the sweet comments on Facebook and on the blog post itself (also I’ve heard that some people are having trouble leaving comments on the blog. If that’s you, try changing your Internet security settings to allow cookies). Anyways, back to thanking you. We got over 100 likes on Facebook! And that’s just on the link that I personally shared. Several other people shared the link as well and I saw those comments and likes also. Wow! I really feel loved! So thanks everyone for the encouragement. It means more than you can imagine. So this week’s fruit is large tomato . . . the babies are supposedly the size of large tomatoes. (you’re welcome Keith). I may be confused but this seems smaller than last week’s fruit (bell peppers). Maybe we just have abnormally large bell peppers? Anyways, the internet told me that the babies should be around 6 inches long and 8.5 oz. That’s pretty close to what my ultrasound showed (7 oz. for Baby A and Baby B and 8 oz. for Baby C). Also their arms and legs are proportional to the rest of their bodies now. So that’s good news! Some new things have happened over the last week. I had my first dream about the babies being here. Crazy! In my dream I was not overwhelmed too which I’ll take as a good sign. Also I have started to feel little flutters when the babies move. Mostly though I only feel them when they all shift to one side (usually my right side). Today, Baby B spent the entire day in my ribs. Not the best feeling in the world. But maybe he just wants to remind me that he’s in there. Believe me it’s hard to forget! Other than the exciting appointment on Monday, I have just been working and trying to relax. Oh and EATING!! I posted in a Facebook group for triplet moms and asked for suggestions for gaining weight. I’ve never done this before but I felt like it was really helpful. I got several responses almost immediately and a few moms even chatted with me on FB about their triplets. Basically everyone just said eat, eat, eat. But I did get a few good ideas – like drink Ensure and Carnation Instant Breakfast, focus on protein, eat things you would avoid when dieting, and eat before bed. Yesterday I ate almost 3000 calories! Wow! I’m on track today too. Luckily I really like things like ice cream and pizza, which have lots of calories to begin with. Now may be a good time to buy stock in Sonic or Gigi’s Cupcakes. Yum!! I feel like I’ve grown exponentially this week. Here’s a picture of me this week. Definitely getting bigger! I guess I’ll only get bigger from here! I read that all pregnant women start really getting bigger around this time so there’s no telling how big I’ll get over the next few weeks. Bring on the double chins. I’m ready. But only if it involves ice cream and pizza. 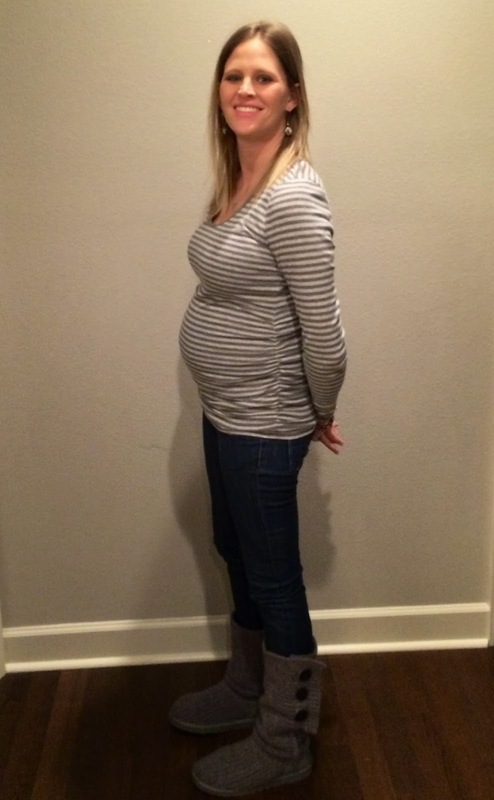 This entry was posted in pregnancy by Angela Mann. Bookmark the permalink.